Thank you for having the é button on Duolingo, but is there any way to find it on standart Swedish keyboard to use outside of it, or you just remember the alt-code for it, or just write is as simple 'e' while talking in web? Wow! That trick works for standard US keyboard in Swedish as well. Fantastik, tack. I don't know about the Swedish keyboard, but with some of them you can use the Alt key on the right (might be labelled Alt Gr) and e to add the accent. Ctrl + Alt + e might work too, try it out! I'm always so tempted to write "alleyways" for this. I've done it way too many times! What does that accent mean? It means that that syllable is stressed, it’s typically found in French loanwords: allé, armé, idé, buffé, filé etc. Ok thanks, does it not have an accent when it's just en alle, or does it only bear an accent when you add stuff? It always has the accent. en allé, allén, alléer, alléerna. But, it isn't a Swedish letter, so is this a word borrowed from french, like how in english we borrow the word résumé from french? @s.wilhelmy0247: exactly! Have a lingot! Okay but do we have to write the accent? Because I know in English we have résumé, but everyone just writes resume...will that be the same sort of thing in swedish or should we treat it like the ö, ä, and å as just another character that is not used as often? If the word has an é in Swedish, writing e is a misspelling. The é is not a letter in its own right though, unlike åäö which are. No, it's not that simple. Swedish borrowed heavily from French primarily in and around the 1700s due to the immense prestige and cultural dominance of France during those times. The imported king-to-be Jean-Baptiste, who took the name Karl Johan upon ascension to the Swedish throne, was rather late compared to a lot of French borrowings into Swedish. Thanks for the info about allé and the accent on the e. I saw that button come up under the typing field a few lessons ago, but I hadn't seen it used yet and I thought I had missed something! About the acute accent: Sometimes the accent mark is used in other languages to distinguish between homophones. For instance, in Spanish el means the (singular, masculine), while él means he. Is the acute accent ever used like that in Swedish? I really don't think so, it seems to be only used for borrowed french words. In fact, there is no é key, its a combination of ´´ and e keys on the keyboard that make it. The program gave me "alleys" as correct translation - might be good to tighten up permitted variations? On mobile so no screenshot. Google tells us that an alternative meaning of alley is 'a path lined with trees, bushes, or stones', so unfortunately I think we'll have to accept that. I say unfortunately because this may be confusing to learners since the basic meaning of alley would be gränd in Swedish. I don't agree that it should be accepted. Not only is it confusing, but a path is not the same thing as a road or street. Surely there is a better word in Swedish for a tree-lined path (e.g. in a garden)? 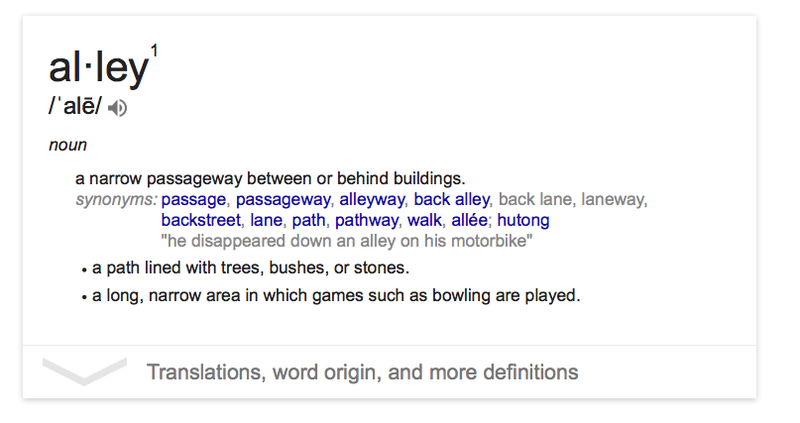 Nobody would ever call a tree-lined road an "alley" in English, because that's not what it is. DuoLingo suggests the correct translation of "Alléerna är gröna" is "The alleys are green", which is just wrong anyway you look at it. allé = avenue = boulevard? Please see the top comment to this thread. I have the é in spanish keyboard. I never learned of a letter "é" in the Swedish alphabet. It's not actually in the alphabet, but it occurs in a few French loanwords. There's so much French in Swedish. So an allé could be a walkway or a roadway, as long as it's lined with trees? Turns out that's what "avenue" means in English, too. I am just now learning this after 42 years of speaking English. I always thought it was synonymous with "street". Why not aveny? Norstedt defines it as avenue. I'm not sure what's accepted in reverse, but this is the "translate into English" exercise. If anything, I'd say it's the other way around - aveny sounds like a huge, pompous thing you'll find in major cities, while I'd expect to find an allé anywhere, really. I exaggerate a little, but that's the general gist.